A complete and functioning quality management system (QMS) is the core of your business's ability to meet customer requirements, build competitive advantage and enhance satisfaction. So you've decided your business needs to implement one. You probably have some policies and processes already in place. You might have multiple sites to roll your QMS out to, and multiple quality standards you want to achieve. You might even have found an electronic quality system to automate and centralise your quality processes as you build them. Any major project like a QMS implementation needs SMART goals, which means you need a clear timeframe in mind. Every business runs on policies, procedures and processes. 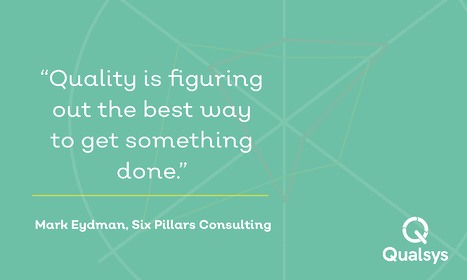 Whether they're fully documented or not, the bundle of principles, activities and actions that you and your colleagues stick to day-to-day is the bedrock to build your QMS on. In other words, you probably already have the key ingredients for a QMS. The first step before building any plans or taking any action is to assess how mature your current set-up is. 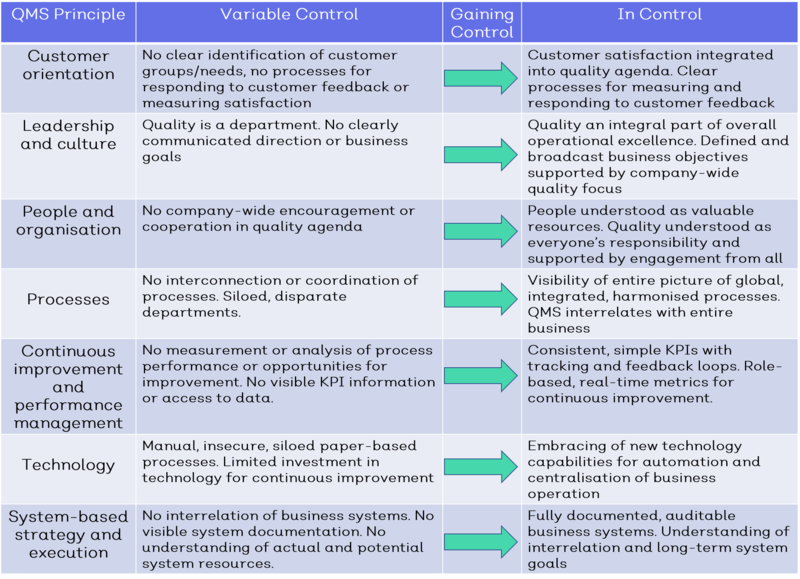 By using control as your maturity benchmark, you can gauge your journey to a fully operational, world class QMS. There are several different ways of looking at this. 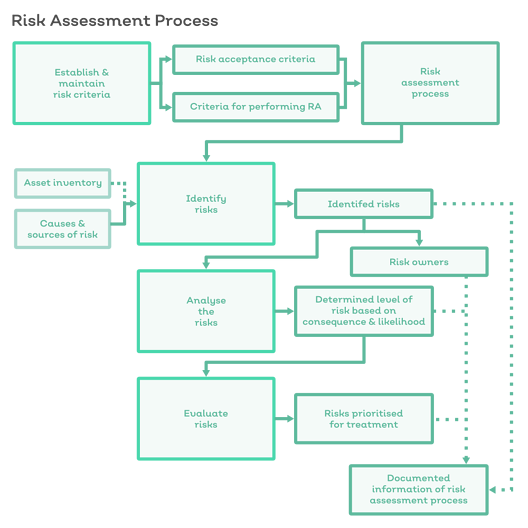 You can start by self-assessing your company's approach to risk, documentation, change control, auditing, and the other pillars of good quality control. Try our maturity assessment quiz to get started. It's also important to understand how your business relates to the high-level quality attributes that ISO auditors look for. Gauging your current quality maturity is no quick and easy task. Give yourself a minimum of two weeks of careful research for this stage. Now we get to the real work. You should now be aware of what processes and policies you already have in place, where you're strong and in control, and where things need to be tightened up. It's time to bring your QMS to life. 1. Create and thoroughly document a quality policy and quality objectives. 2. 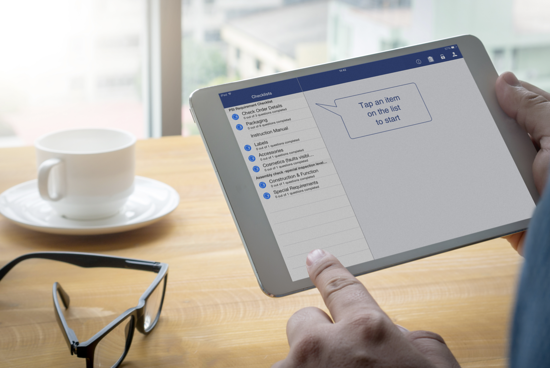 Create and thoroughly document a quality manual including scope, justifications for any exclusion, documented procedures and process interaction descriptions. This will specify how your QMS will be observed and emphasise your company's commitments to both continuous improvement and quality. 3. Now think back to the processes and procedures you've identified already. Put together any documents needed to ensure the effective operation, planning and control of these processes. 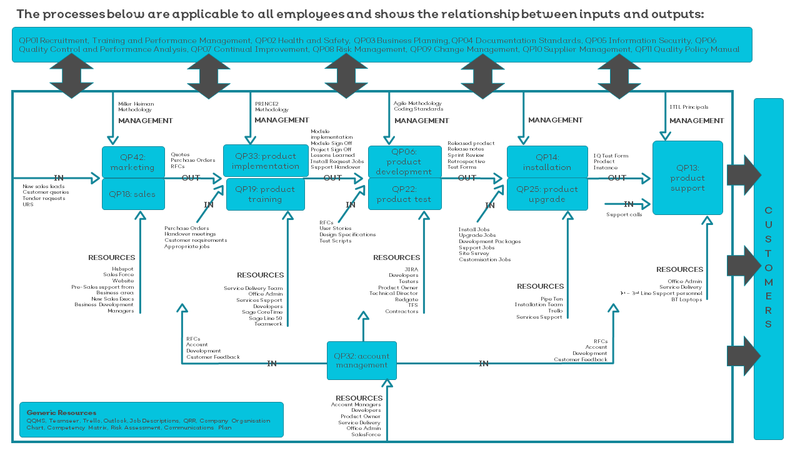 Build flowchart maps for simple visual depiction of each process. Tackle them methodically, one at a time, getting feedback for the relevant personnel at each stage. And don't forget to create blank documentation templates for changes and additions in future, to ensure consistency. 4. Start to build records of evidence of conformity to your QMS requirements and of effective QMS operation. These could be audit findings, before-and-after data snapshots, or CAPA plans. 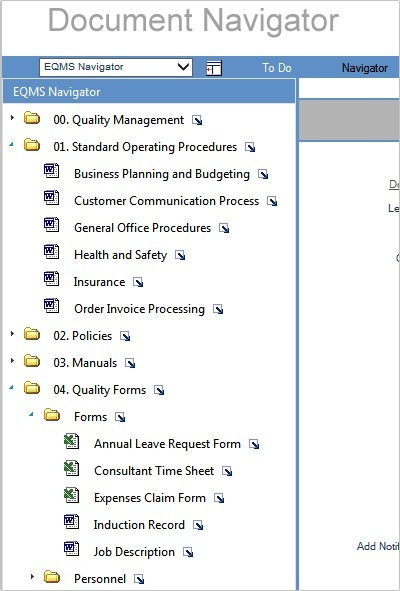 A clean, clear, cogent documentation system is invaluable here, giving you the chance to categorise and collect the components of your QMS in a logical way as you build them. Needless to say, you can't do all this in isolation. A real and effective QMS will touch - and change - the working lives of everyone at your business. 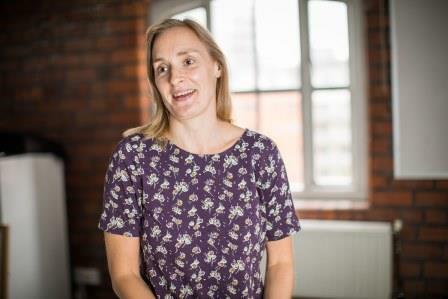 That means there will be feedback, suggestions and potential ruffled feathers to deal with as you implement your QMS. Consider carefully how you'll communicate your new QMS as you build it, and shape it around preferences and suggestions as appropriate. Emails, meetings and presentations will be needed to gain support at all levels of the business. Don't focus purely on the coalface and neglect the senior support you'll need to drive top-level change. Equally, don't focus entirely on C-level feedback and implement a QMS that doesn't work practically at ground level. Build your processes, document them, and prepare to adapt them to make them stick and be as efficient as possible. How long to build a working QMS structure? It will depend on the size and complexity of your business and the resource you can dedicate - but 4-6 months is a good rule of thumb for getting your QMS off the ground. Remember the evidence of QMS operation that Kate recommended you put together from the very beginning of the process? ISO 9001:2015 is the certifiable standard for the modern business quality management system. It's the globally recognised stamp of approval that you've implemented a QMS, in the real sense of the phrase, that works. So the next step on your journey is to prove the value and operation of your implemented QMS by gaining ISO 9001:2015 certification. Of course, this is entirely optional. You can have a functioning QMS without 9001 certification. Once your quality objectives and processes have been put together and you're confident that your records, policies and procedures are being actively followed, updated and maintained, it's time to contact an auditing body and get your ISO 9001:2015 audit set up. Depending on your auditing body and their availability, you may have to wait a couple of months for your Stage 1 audit. Schedule frequent internal audits in the meantime to keep tabs on your QMS operation and highlight any areas to tweak and improve. Your Stage 1 audit will compare your active and written quality procedures to the requirements of ISO 9001 and offer guidance for potential improvement - it's about pinpointing your readiness for Stage 2 and ensuring that the ISO requirements are understood, communicated and properly documented. Then a 30-90 day timeframe to prepare between Stage 1 and 2 is recommended. Stage 2, the actual certification audit, will then evaluate the effectiveness of your management system. The QMS evidence you've already been collecting will be invaluable here - make sure you have as much to show your auditor as you possibly can. If you pass, congratulations! Your business is certified to ISO 9001:2015. If not, take stock of what went wrong and make the changes your auditor recommends before trying again. How long from QMS-building to passing the ISO 9001:2015 audit? We asked one of our customers. Well, it took us 6-7 months from start to finish. But it's important to consider what kind of business you're working with. We're lucky in that we don't produce anything, so it was perhaps easier for us to become 9001-accredited than, say, a steel plant. So if your business manufactures product, you'l probably find the accreditation process takes longer than if you are a tertiary sector service provider - your auditor will want to inspect in detail your end-to-end manufacturing processes and product quality assurance procedures. If you take into account the 4-6 months of QMS-building and 2-3 months of 9001 preparation and auditing, you can expect roughly a 6-9 month timeframe from starting your QMS to securing 9001 accreditation. 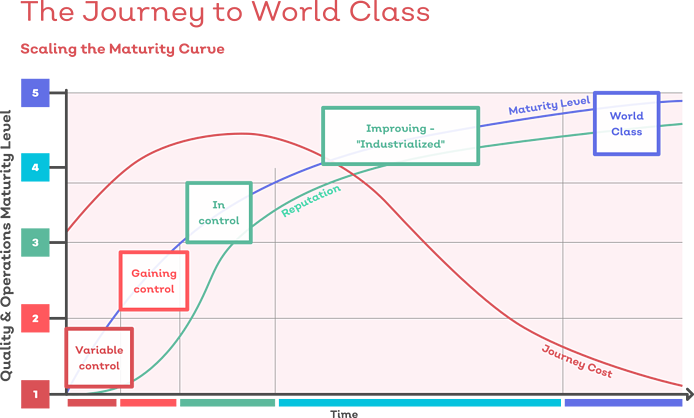 You're now at the 'in control' stage on your business maturity journey to world class. You've implemented a working QMS and secured ISO 9001 certification. The majority of prominent and stable businesses sit about here on the maturity curve. Assuming you maintain your certification requirements and are passing your surveillance and re-certification audits, you may not want to or need to develop your QMS any further. But more and more businesses are choosing to take their QMS maturity to the world class level and slice their compliance costs by managing their processes electronically through QMS software. Some even do so before certification and as they're building their QMS to make those processes simpler and faster. If you can secure interest and internal traction with a strong business case, it could be worth considering setting apart a separate timeframe for an electronic QMS implementation. 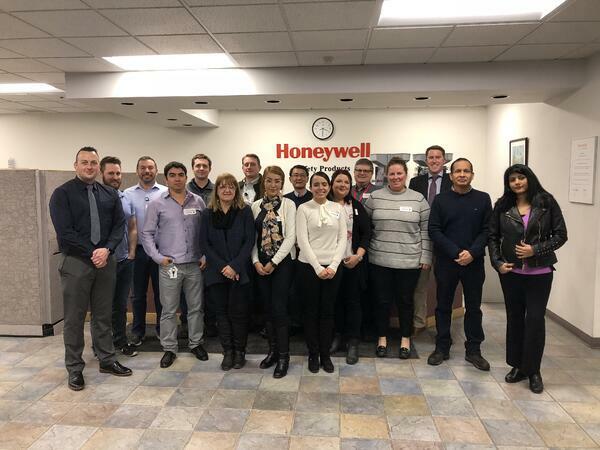 American multinational manufacturer Honeywell began their electronic quality management system implementation in 2018 to embed centralised, identical, automated QMS processes across their worldwide operation. 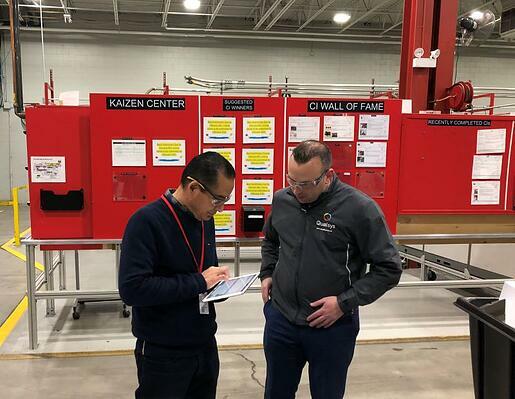 The Qualsys service team began a 2-phased implementation and training programme, with Phase 1 targeting 24 Honeywell sites and Phase 2 covering 49. With a 'train-the-trainer' approach, a new electronic quality system can be exponentially rolled out to thousands of end users in a short timeframe. 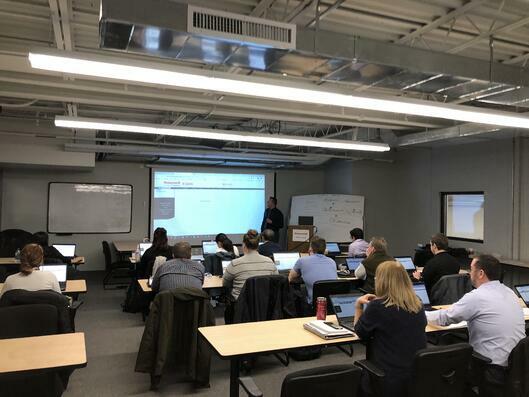 Qualsys's service implementation team visited sites in Paris, Partizánske, California, New York, New Jersey and Rhode Island in January 2019 to train Honeywell's champion users and embed EQMS into the Honeywell operation. 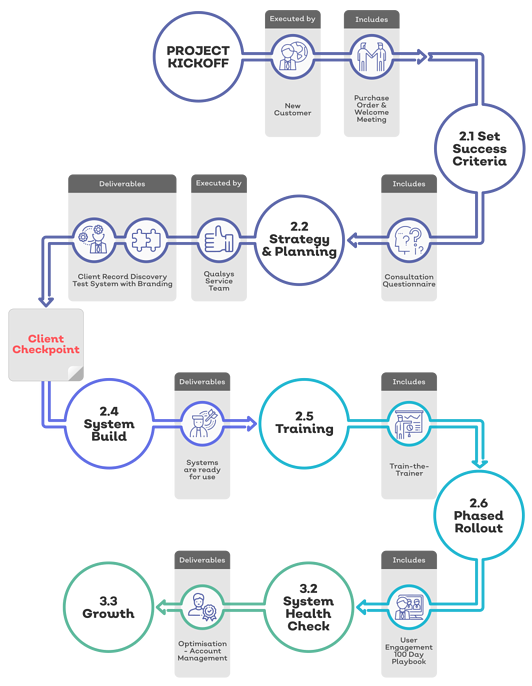 The combination of Phase 1's 4-month timeframe and Phase 2's 3-month timeframe from start to 'go live' is a good rule of thumb for a complex, multi-site EQMS implementation process. But if your business is smaller, a 3-4 month timeframe is more realistic, depending on how many quality management modules you choose to implement. Whatever electronic system you choose for your QMS maturity journey, giving yourself sufficient time to inform and train staff before going live is crucial for ensuring uptake and long-term consistent usage. So build a thorough vendor scorecard and take service and support offerings into account as you weigh up potential partners. With some careful work, a switched-on quality team and a willingness to invest in new technology, your business could make a significant leap along the quality maturity curve within a single year. And implementing QMS software earlier in the process will make the construction and certification stages even quicker. How far you want to mature your QMS is up to you. Download our QMS software implementation booklet to learn more about how electronic quality systems are built across the globe by the Qualsys team.